* Discounted Room Rates to Florida Light Tackle Charter Clients. About: The first non-natives to visit were Spanish. Ponce de Leon arrived in the vicinity of Charlotte Harbor in 1513. In Charlotte Harbor, families of Spanish-Indian fishermen continued their salt fish trade in relative isolation as they had since the 1760’s. By 1872 the Charlotte Harbor area had its own post office and along the Peace River shores, vast tracts of land had been converted into large cattle ranches. Trains arrived in 1886 and a year later, in 1887, the town incorporated itself and changed its name back to PUNTA GORDA, which means “broad or fat point” in Spanish, the name used previously by the Spanish to refer to the area because of how it protrudes into the Harbor. Punta Gorda became the only incorporated city and the oldest municipality in Charlotte County. 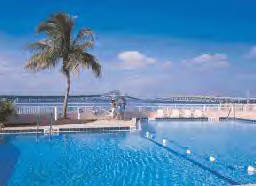 That same year, the huge Punta Gorda Hotel opened its doors to 3,320 guests. By 1897 more than 230 people worked the offshore fisheries. Gill netting for mullet was the most profitable activity. Spanish mackerel, oysters, and channel bass were also harvested in quantify. Citrus and truck farming, and cattle ranching were other primary sources of income for people living in Punta Gorda. Wealthy visitors coming to the Punta Gorda Hotel spread the word about the great sport fishing found in the waters off Boca Grande and Gasparilla Islands. A bridge across Charlotte Harbor to Punta Gorda was completed in 1921. The Tamiami Trail, which linked Florida’s east and west coasts, was finished in 1928. The 1929 stock market crash brought the Florida economy to a halt. During the Great Depression, government work projects were implemented and Punta Gorda’s water system was constructed. World War II brought relief to the stagnant economy. The Punta Gorda airport was used for pilot training grounds during the war. Beginning in the late 1950s, the General Development Corporation created the communities of Punta Gorda Isles, Burnt Store Isles, North Port and Port Charlotte. Historical information thanks to "Berson Properties"